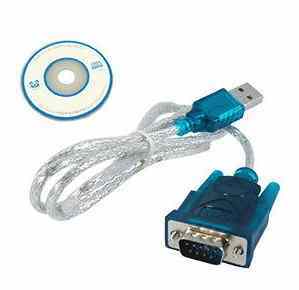 USB Serial Port: How to setup an RS232 serial link through a USB port. I use a USB serial port for RS232 communications all the time on my projects RS232 since it is a very useful standard communication module which can be found built-into PICs and most other microcontrollers. Computers used to come with RS232 and parallel port built-in as standard, but not any more as new computers have USB ports instead. It is found in internal hardware modules of microcontrollers. It has minimal connection requirements (minimum is three wires). It has robust communication over fairly long wires i.e. noise tolerant. The digital serial unit does away with all RS232 comms (and cables) and outputs only digital signals. This is the generates the same as the signals that you get at the microcontroller, after they are decoded at the MAX232 chip. Using this unit means that you can plug the signals directly to the microcontroller RX TX pins (connect digital serial Rx to uC TX and digital serial Rx to uC Rx to communicate correctly) and you do not even need a MAX232. The disadvantage is that you do not get noise immunity over long distance which the the RS232 interface does provide, but this is not a problem when working directly beside the units as I do. I use the digital serial all the time. This is the one I use - if you move the connectors a lot you can buy new duponts to replace them - it also as a low power 5V and 3V output for very simple circuits and it installs without a disk! It also has a couple of LEDs on board shown when comms is active - sometimes useful. Search for above text on ebay. There are bound to be others available if you can not see that exact one. The RS232 unit provides all RS232 signals (between +-3V to +/-12V) and will plug into the MAX232 device. Since RS232 voltage levels are generated it will allow operation over long cables. For this method you will need the MAX232 chip (or equivalent) connected as shown in the circuits to decode/encode the RS232 signal levels for the PIC's digital i/o. Search for above text on ebay. There are bound to be others available if you can not see that exact one.. I have tested this on the on-site project "serial LCD" and it works as expected. Either of the above USB serial interfaces will do the job. Note: The RS232 version means more work in wiring up a level translator chip e.g. MAX232 and you won't see much benefit other than operation over longer distance, for normal use. The desktop advantage can be seen in that the uint will generate all signals (not just TX and RX) so you can observe the signals DTR and RING and these can be made to power a small device (with a few diodes) or provide hardware handshake operation. To progress, next you need a terminal program running on your PC so that you can send data to, and receive data from the microcontroller. A suitable program is "Tera Term" which is a free. All you do is plug your chosen USB to serial interface into the USB port and connect to the development board and then start The terminal program.